The top topic of the week – Trump won. What next? When is it not a good time to use agile? How much of an idea do you need to secure funding/investment? Role of a non-tech person in an agile team? Product Architect job description. What would it say? It’s getting to that time of year in the CBR, school holidays. Pretty soon it will be a ghost town. 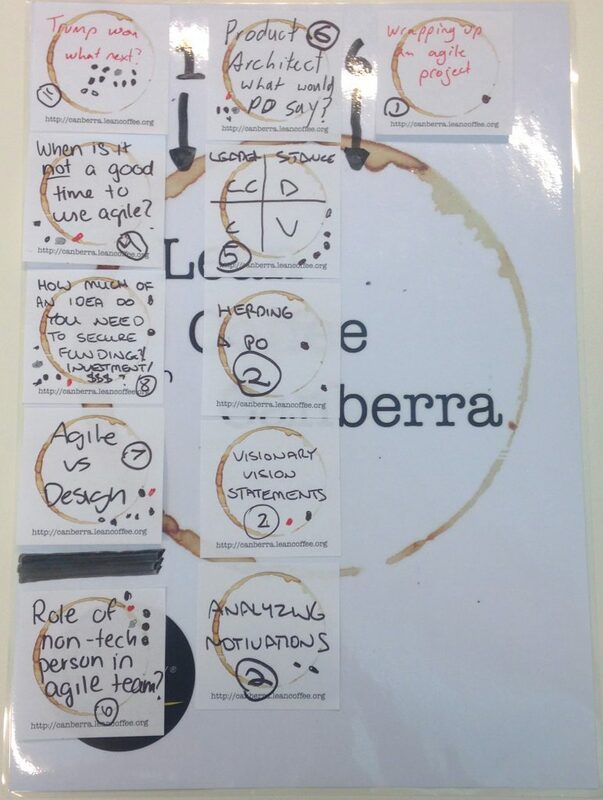 But Lean Coffee will still be going strong with the people we have. The people that are meant to be there, are there. Thanks Harrison Owen! Posted on November 21, 2016 November 21, 2016 Tags design, funding, investment, Leader stance, motivations, Product Architect, Product Owner, Trump, visionLeave a comment on The top topic of the week – Trump won. What next?